3- Inorganic Chemistry (practical) – Third year. 2- Electronic spectra for coordination compounds. Ayad H.Jassim,Bassim I.Mehdi and hayder H.Mihsen ,Some metal complexes of Schiff- Base derived from dithiooxamide and 2, 4, 5-trimethoxeybenzaldehyde.,J.of the University of Kerbala,Vol.3,No.12,6-17(2005). Bassim I.Mehdi and hayder H.Mihsen, Synthesis, Characterization of Ti(III),Cr(III),Fe(III) metal complexes by ligand ρ-phenylenediamine and N,N\ bis (3,4,5-Trimethoxybenzylidene(ρ-phenylenediamine).,J.of the University of Kerbala,Vol.5,No.4,682-692(2007). M.Bashee,brhan .R.Noree and hayder H.Mihsen,Measuring the conductivity and the permitivity for a sample of intercalated clay type Bullgite. J.of the University of Kerbala, Vol.5,No.4,676-681(2007). H.Hihsen, Synthesis, Characterization of Titanium (III) Complex with Aurintricarboxilic acid and Study its Interaction with Some Blood..J.of Babylon University. Vol.15,No.2,556-568(2008( . Alaa F.Hussein, Hayder H.Mihsen and Saed Y. Rfaesh Novel spectral study to determination copper ion by using reagent ρ-phenylenediamine(P-PDA). J.of the University of Kerbala,Vol.6,No.3,1-9(2010). H.Hihsen,Ahmed W.Radhe and Saed Y. Rfaesh.J Synthesis, Characterization of Tin (IV) by using Schiff- Base derived from ethylenediamine and aromatic aldehydes..of Babylon University. Vol.18,No.2,2010. Hayder H.Mihsen,Ahmed F.Khdayer and Saed Y. Rfaesh ,Synthesis, characterization of Zr(IV), Ni(II), Hg(II), Pt(IV), Cu(II), Pd(II), Co(II) and Rh(III) by using reagent Aurintricarboxilic acid.Haythem D.Hanon, J.of the University of Kerbala,Vol.6,No.3,33-43(2008). Thana Jaafar Al-Hasani , Hayder Hamied Mihsen , Kasim Mohammed Hello , Farook Adam Catalytic esterification via silica immobilized p-phenylenediamine and dithiooxamide solid catalysts, , Arabian Journal of Chemistry (2013) (in press). Hayder H. AL-Hmedawi Rawaa Abdulkhaleq, Synthesis and Characterization of Co (II), Ni (II) and Cu (II) Complexes via Schiff Base Derived from Dithiooxamide and Salicylaldehyde, Journal of Kerbala University , Vol. 11 No.3 Scientific . 2013. Kasim Mohammed Helloa,, Hayder Hamied Mihsen, Mosa Jaafar Mosab, Modification of silica with 2,4-dinitrophenylhydrazanomethylphenol for monosaccharide production (Iranain journal of catalysts) 4(3), 2014, 195-203). 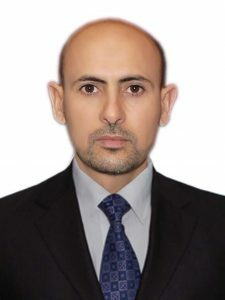 Kasim Mohammed Hello , Hayder Hamied Mihsen , Mosa Jaafar Mosa, Mahmood Shakir Magtoof, Hydrolysis of cellulose over silica-salicylaldehyde phenylhydrazone catalyst(Journal of the Taiwan Institute of Chemical Engineers) ,Volume 46, January 2015, Pages 74–81. Hayder H. AL-Hmedawi and Rawaa Abdulkhaleq, Preparation and spectral study of Co (II), Ni (II), Cu (II) ,Pd(II) and Pt(IV) complexes containing N2 donor atoms, Albahir,Quarterly Refereed Journal for Natural and Engineering Research and Studies. Albahir,Quarterly Refereed Journal for Natural and Engineering Research and Studies. Vol. 2, No. 3 and 4, P.(48-67),2016. Hayder Hamied Al-Hmedawi and Sarah Abdulhussein Alfahdi, Synthesis and spectroscopic study of transition metal ions (Co(II), Ni(II), Cu(II) ) complexes containing a mixed ligands via salpphen and some of amino acids, Journal of Kerbala University, Journal of Kerbala University,vol.13,No.4 ,156-176(2015). First scientific conference for biology in 18-April – 2012,college of science- Thi Qar university. Eighth scientific conference in 6-May – 2012,college of science- Al-mustensera university. First scientific conference for science college in 13-March – 2013,college of science- Karbala university. Third scientific conference for science college in 25-February – 2015,college of science- Karbala university.